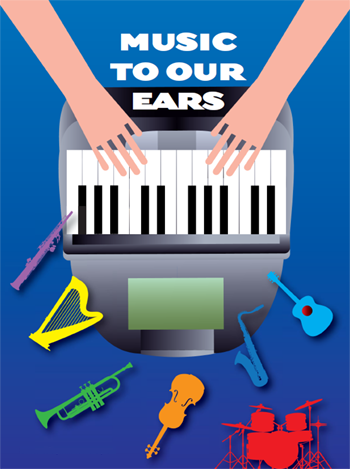 Court reporters chime in on how playing musical instruments helped with their careers. When kids learn an instrument, teachers sometimes tell them “you’re a natural” or “you have a great ear.” It’s true that many are born with talent, but for most, it’s a combination of talent and hard work. In other words, it doesn’t come easily. There are endless hours of practice to hone skills and become great musicians — which is also true about court reporting. So this made us wonder — does it make a difference in how reporters get through school and get a start in the field if they have a musical background? Does playing an instrument help with finger dexterity on a writer? Does the experience of hearing notes, reading music, or playing in a band help with captioning the spoken word? To get to the bottom of this, we spoke to several court reporters who have spent years playing instruments. Linda Fritsch, RMR, from Largo, Fla., has worked as a deputy official court reporter and has done depositions and civil court work. Fritsch started playing the piano when she was eight years old and continued studying music in college after playing in the high school orchestra. When she started court reporting school, she found playing music gave her a head start in the program. When it comes to playing, you either stick with one instrument or you play several. In Victoria (Tori) Pittman’s case, she started with piano then picked up the oboe, violin, baritone sax, and bass violin. Pittman, RPR, from Wake Forest, N.C., was in the school orchestra and was also in an allcounty band as well as an all-county orchestra and the Mohawk Valley Symphony. To say she’s accomplished is an understatement. She no longer plays these instruments due to the time needed to practice, but her musical experience has helped in many ways when it comes to court reporting. “Having the manual dexterity and the hand-eye-ear coordination definitely helps. You can feel and hear when your fingers are in the wrong place,” Pittman says. She also mentions a rule her high school band leader kept. “He always said, ‘If you’re on time, you’re late.’ Meaning your music is up and ready, and you should be ready to play when the time for brand practice hits. I was never late for class. Ever!” Pittman adds that because she had to practice to get a piece right, she knew it wasn’t going to just magically hap ; she knew that it would take a lot of effort. Pittman is not sure about the correlation between music and court reporting in regard to attaining her skills faster, but in other ways, she thinks it has helped. Just like the variety of court reporting professions, there are also a variety of types of musicians. Michelle Grimes is a freelance court reporter from Joliet, Ill., who has been a drummer since she turned eight years old. She started taking lessons and had formal training during grade school. After a while, she wanted her own drum set, but her parents weren’t too keen on the idea. So she waited, and at 19 years old, with determination and a little luck, she bought her own after selling a fax machine she won in a Chicago radio contest. Once she got the set, she started playing in a few rock bands at festivals, benefits, and clubs in the Chicago area. Then, she took time off, but for a good reason — court reporting school. “After a five-year hiatus of not playing so I could get through court reporting school and begin my career, I have recently returned to playing for myself, not in a band, and I am working on honing my hobby with more technical stuff as my time and schedule allows,” Grimes says. She adds that playing the drums is her reward for getting work and other necessities done. “The biggest lesson playing drums has taught me is that in order to become very proficient and skilled at something, it takes a lot of practice, dedication, concentration, discipline, and perseverance. It’s hard work. There is no easy way to get there. It has taught me discipline and dedication, and it has helped my concentration. All of that is necessary, I believe, to becoming a skilled and proficient writer,” Grimes says. This thought actually helped with her decision to put playing on hold while in school. Grimes says, “I knew that if I had my drums around, I’d be more tempted to play them than practice on my steno machine, so I had to put them away, which was really difficult for me. I missed them dearly. Thankfully, we are happily reunited.” While some people think that musicians might listen better, Grimes points out a different similiarity: “I notice that there is a natural cadence or tempo in which most people talk. The drummer is the keeper of the time for the whole band. I often connect with a person’s cadence of speech while I’m writing. Syllables are to words as notes and beats are to drums — for me, anyway.” Grimes also sees how reading music has helped. In fact, she mentions punctuation and grammar author Margie Wakeman Wells’ theory that reading the written steno notes creates “grooves in the brain” and improves muscle memory. “Muscle memory is taught in both court reporting and drumming. It dee s as our eyes see and recognize the steno outlines and music notes. I think reading music creates grooves in a similar way,” Grimes says. Even though at one point she wanted to be a professional drummer, she chose the court reporting field because the Bureau of Labor Statistics said there were more jobs than people to fill them. After her five-year hiatus of drum playing, Grimes is happy to be back on her drummer’s throne and comments how drumming has taught her a lot of lessons about life and court reporting. “Playing set the foundation to help me get through many challenges of court reporting — dedication, determination, overcoming defeat and disappointment, celebrating successes, facing new challenges, and relieving stress,” she says. For Lori Judd, RMR, a freelance reporter from Las Vegas, Nev., it wasn’t as much about relieving stress as it was about learning something new. So when she turned 40 years old, she bought a harp. Even though she had a lot of music experience and a degree in music performance, Judd confesses to being a beginner. “I knew from my previous music study that I needed to practice at least a little every day,” Judd says. This practice paid off because now, 15 years later, Judd plays gigs all over Vegas and is the principal harpist for the Henderson Symphony Orchestra. “More than anything, I think the skill that reporters develop is an ear/hand coordination. Musicians have the ear/hand coordination, too. Musicians have to learn a new language — reading music — and become proficient at thinking in terms of notes and chords, and reporters also learn a new language — steno — and become proficient at thinking in steno,” Judd says. Rich Germosen of North Brunswick, N.J., readily recalls how music helped when it came to court reporting school. As a saxophone player since the fifth grade, which included participation in the concert, marching, and stage bands, Germosen vividly remembers the first week of court reporting school. “We were all doing finger drills, and when we got to the ring finger, everyone was moaning and groaning at how hard it was to drill the ring fingers. I was doing the ring fingers pretty quickly, and I remember looking around wondering why everyone else thought it was so difficult,” Germosen says. Even though he no longer plays the saxophone, Germosen be lieves playing has continued to help him in his career. “Playing an instrument is sort of like writing on the steno machine. The more you practice, the better you get. All that practicing an instrument sort of set the stage for practicing on the machine in school. But I think I didn’t notice all that until after I was out of school and reflecting back over the years,” says Germosen. It also taught him how to practice consistently, and as he states, court reporting school is all about building skills on the machine by practicing a lot. He successfully finished school in just a little more than 22 months and passed the New Jersey CSR on the first try. “I wanted to pass the first CSR I took so I did a total of five hours a day of practice on the machine from June through October.” He’d wake up at 5 a.m. and do two hours before school, then practice for three hours at school from 3 p.m. to 6 p.m. All that practice has paid off, and he has been busy with work ever since. “If you ask me, I was supposed to learn how to play the saxophone to prepare me for a lifetime of writing on my machine. And here I am, almost 21 years later,” he says. “I was shocked!” Hromek recollects. “That’s what I thought I’d be doing.” She took what her mom said to heart. Soon thereafter, she spotted an ad in the Chicago Tribune talking about court reporting school. “When I was 16, Mom and I, with Dad’s approval, went to visit the school. I signed up,” Hromek says. During the time she went to court reporting school, she had to stop practicing piano, which broke her heart. But since she was used to practicing the piano 3 to 5 hours a day, she put that energy into her steno machine. Those years of playing the piano, especially preparing to perform, caused Hromek to strive for perfection. “Everyone can hear if I make a mistake. That comes pretty close to writing realtime, as I do for every job. So, I believe there is a close correlation between the two,” she says. Hromek still plays the piano, but mostly at her home. It gives her a relief from stress that builds up with life or work. “Even after many hours of writing on my steno machine or editing on my computer, even if my back is aching and my head is tired, I still find myself sitting down to play a song. In fact, ‘play a song’ is a phrase I used daily. I say to my retired husband, ‘I think I will go play a song.’ He says, ‘Go play a song.’ [But] I seldom only play one song,” she says. Now at age 63, Hromek believes the exercise from playing the piano has given her hands and arms exceptional durability. And she fondly remembers how much she loved playing at a younger age. “When I moved away from my childhood home to Chicago, my first piece of furniture was a brand-new Chickering baby grand piano. I didn’t know how they would get it up to the 47th floor in the elevator, but they did. I bought that before I bought a bed. I knew I could always sleep on the floor, if I had to, but I couldn’t live without a piano,” she says. Our list of musicians wouldn’t be complete without a clarinet and guitar player. Linda Breech, RPR, from Santa Clarita, Calif., is an official reporter for the Los Angeles Superior Court. She started out with piano at age six, then moved on to clarinet and guitar in middle and high schools, where she, like Germosen, played in the marching band. After speaking with our musically inclined court reporters, we can see how a combination of finger dexterity and hand-ear coordination played a part in helping them get through school and become successful reporters. But one thing is even more evident — s ding years practicing an instrument every day set the stage for court reporting school and passing the exams. It was, in a way, knowing what to expect, having s t all that time practicing something to perfection. In other words, even with capturing the spoken word, there are no short cuts. Would Rachmaninov, Joan Jett, or Miles Davis have been great reporters? Most likely — if they practiced for hours, were dedicated and highly disciplined, and could persevere. The world’s third speed contest took place nearly two centuries later, triggered by an article written about the second. Shorthand writers of the time were given to overstatement and claimed speeds of 400 wpm, even 500 wpm, were not uncommon — although in fact they only resulted from vivid imaginations. 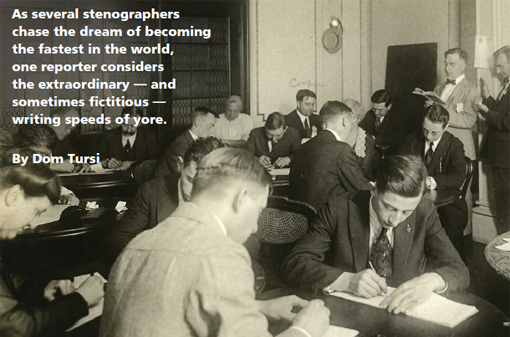 At the 1886 Annual Meeting of the New York State Steno Association (later the New York State Court Reporters Association), a paper entitled “Stenographic Braggarts” debunked such assertions. So profound was this writing that it influenced court reporter A.B. Little of Rochester, N.Y., to offer a gold medal valued at $50 to anyone who could demonstrate the ability to write 250 wpm for five consecutive minutes, and convention discussion developed that no one present had ever seen anyone write even 225 wpm. No one accepted Little’s offer. But when Little reoffered it in 1887 (adding that it had to be read back without error), Isaac C. Dement, from Detroit, accepted the dare. He read it with 40 errors and therefore was awarded neither the coin nor the title of champion. The stage was now set. It is appropriate to pause at this juncture. Outrageous claims of extraordinary shorthand speed have been associated with shorthand seemingly forever. In 1919, 300 wpm for five minutes (99.9 percent) was proclaimed as the speed to beat, followed later the same year by announcement of a “New World’s Record” at 322 wpm. And there was the infamous claim, reported in the New York Times, of 350 wpm in 1922. (See the sidebar for a fact/fiction discussion.) Owing to the “absurd, ridiculous, and false” claims of shorthand speed made by “unscrupulous shorthand writers” of the time, a reliable, professional platform for the determination of shorthand speed excellence was necessary. These and earlier preposterous claims led the National Court Reporters Association to institute annual speed contests in 1909. In 1958 and again in 1960, Nathaniel Weiss followed their sixyear reign by duplicating Dupraw’s 1926 record-setting feat of eight total errors (99.789 percent). Many fictional claims have been associated through the years with man’s attempt to demonstrate extraordinary shorthand speed. Let’s analyze some historically important exaggerations. All contestants (except Mr. Behrin) were conceded a handicap based on best prior NCRA performance. Ward Stone Ireland, while promoting his new stenotype device, infuriated the shorthand profession with declarations that his students could perform at 600 wpm. Although his students were victorious, such boasts antagonized the seasoned pen writers and galvanized them against the “renegade” machine writers. This largely influenced their excommunication from national speed contests for nearly 40 years. NCRA’s Legal Video Conference brings great educational opportunities to legal video community. Legal videographers of all levels of expertise are encouraged to register to attend NCRA’s Legal Video Conference, Oct. 18-20, at the Hyatt Regency at the Arch, in St. Louis, Mo. Formerly known as the CLVS Symposium, the conference is the largest NCRA event dedicated specifically to the legal video profession, and it will feature the two-day CLVS Seminar and the Legal Video Forum. This year’s conference offers the perfect opportunity for CLVS candidates interested in taking that first step toward certification to attend the CLVS Seminar scheduled to run on Friday and Saturday (Saturday is mandatory for certification). Attendees can earn up to 1.2 CEUs (or up to 1.8 CEUs for NCRA credential holders taking the CLVS Seminar for the first time). Certified legal videographers can also expect a program packed full of intermediate- to advanced-level sessions that will be presented all day on both Saturday and Sunday. The sessions will be tailored to provide a wealth of insight and information about the latest trends and advances in the legal video profession. In addition, candidates attending the CLVS Seminar can also attend the Sunday portion of the Legal Video Forum at a discount. Symposium attendees will have the opportunity to network during a Saturday’s evening reception. They will also be able learn about the latest in new products and technologies at the exhibitor booths that will be open throughout the conference. Deadline for hotel registration is Sept. 30. Register online by Friday, Aug. 30, for a chance to win a free hotel stay up to three nights. Registrations received after the Sept. 30 deadline are subject to a $50 late fee. For more information and to register, visit https://resweb.passkey.com/go/NCRA13, or call 888-421-1442 and mention NCRA. * These options only available to candidates with professional legal videography experience. What happened @ TECHCON 2013? NCRA’s second technology conference offered ample chances for attendees to network and learn more about the profession and the continuing influx of technology in the field. Ignite speaker Maureen Walsh (left) compared making mistakes to the explosion of the Hindenburg, but said education truly helps people work to their highest potential. Providing ample opportunities for attendees to share information, exchange ideas, and expand their professional networks , TechCon 2013 attracted hundreds of legal professionals from different corners of the industry. The event, held April 19-21, combined the best of NCRA’s technology workshops with unique approaches to conference learning, tailored specifically for court reporters, legal videographers, and trial presenters. In her welcome letter, NCRA’s president Tami Smith Keenan, RPR, CPE, encouraged attendees to not only enjoy the opportunities to network with their peers but to be excited to learn from a dynamic group of expert speakers. “Get ready to be inspired to envision your future, discover new trends and technology, and advance your skills,” said Smith Keenan. The program included nearly 30 legal tech labs over the course of the event, and the topics ranged from emerging trends and gadgets, taking your profession mobile, and international depositions, to focus groups and panel discussions that covered various aspects of legal technology. One of the focus groups discussed selling and delivering tech-based services to attorneys. Panelists Mark E. Lassiter, J.D. ; Geoffrey Thomas, J.D. ; and Steve Crandall, J.D., CLVS; with moderator Christina Lewellen, MBA, NCRA senior director of marketing and communications, led the conversation on the ever-changing legal industry, including the changes in structural make-up of several law firms and how to communicate the value of services to clients. Lassiter explained that in the current marketplace lawyers are struggling to find work, which is causing many law firm partners to look into restructuring their organizations and how they conduct business. Clients are pressuring attorneys to abandon the long-standing hourly approach to legal services in favor of flat-fee project management, he said, adding that this approach would provide clients with clearer expectations for what pursuing a lawsuit or defending a lawsuit might cost. He suggested that court reporters and court reporting firms might be asked to consider restructuring their fee arrangement as well, in order to better align with and compete in this shifting environment. Some attendees in the room mentioned that some law firm clients have asked for quotes based on the number of depositions rather than the traditional per-page structure. Lassiter confirmed that this request is likely to increase in frequency for court reporters and court reporting firms. “Everybody, including the lawyers, has to give more and better service at a lower cost,” he said. Thomas and Crandall weighed in on the importance of court reporters making the extra effort to sell the value of their service in order to ensure business. Crandall suggested offering transcript-synchronized video and maintaining active connections on social media outlets, as well as attaining referrals, as possible ways to increase business. “Explain the other options that are available and be sure to follow up, ask how you did, and encourage feedback from your clients,” he advised. In addition, Lassiter expressed the importance of leveraging time spent in front of a captive audience. For example, rather than trying to set up a separate appointment in a packed schedule, catching a lawyer during the cleanup of a deposition may be the perfect time to express the value you bring to the table and how it plays an integral role in today’s market. “Know your market, know your customer,” he said. Another highlight of the conference included a cross-functional panel discussion about what emerging trends mean for the future of the legal technology industry, led by NCRA Executive Director and CEO Jim Cudahy. Referencing more than 6,300 survey responses, the panelists Brian Clune, CLVS, Tim Piganelli, NCRA Trial Presentation Professional, and Robin Nodland, RDR, CRR, discussed what the data indicates about court reporters, legal videographers, and trial presenters. Other survey results reviewed in significant detail during the session included the popularity of Windows in the legal industry and constructive uses for social media. The importance of how social media is being utilized by the profession was especially brought to light by the fact that more than 40 percent of those surveyed said they access Facebook on a daily basis. According to several of the speakers over the course of this year’s TechCon event, cloud-based computing, syncing programs, and Web security are crucial to the mobile court reporter, and many noted that as the profession transitions, it is important to keep an eye on these technologies and the changes that are still to come. Daniel Bistany of Breeze IT, Inc., reminded attendees of the importance of securing your network and devices especially while on-the-go. After demonstrating a Google search of the word “password,” one search result displayed a list of more than 2,150,000 common passwords. This reinforced the need for careful selection of passwords, being sure to use a combination of upper and lowercase letters, numbers, and symbols, while avoiding common selections. Bistany also suggested that wireless Internet passwords be changed on a quarterly basis. 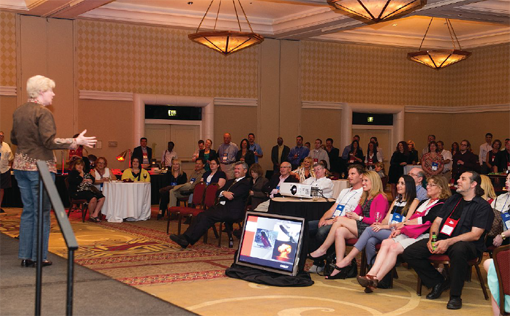 The Ignite session and reception, where learning is merged with entertainment, was back by popular demand after its debut at last year’s TechCon event. Ignite engaged the audience with six, fast-paced, fun, and thought-provoking presentations that engaged and entertained the audience. Visit NCRA’s YouTube Channel to see the footage of this year’s presenters, or visit NCRA.org/ignite. Check NCRA.org for updates about the event. The Last Page: Who’s laughing now? Q. And you used to be a dancer. When you say “a dancer,” what do you mean by that? Q. That’s not what I meant. In fact, that wasn’t even what I was thinking. I’m wondering whether it was, like, you know, ballet or what. Q. Your attorney and I will try to pay attention, and if you say “Uh-huh” or “huh-uh,” we may go, “You’ve got to say yes or no.” Don’t let that shake you, because I bet you will say “uh-huh” once or twice today. Defense attorney: Yes, ma’am, have you served in the military? Female potential juror: No, I’ve never served in the military, but I’ve done a few military guys. Lisa B. Johnston, RMR, CRR, CCP, CBC, Palm Bay, Fla. The Court: Do you have him in foster care? Witness: He actually is in a group home. He needs some counseling. I think his mom passed away right in front of him, and he was in the car with her, and so there are lots of issues that probably have never been addressed at all. Mr. Smith: That’s all I have. The Court: Step down. Thanks. The Court: Based on the evidence that I’ve read, there’s probable cause to believe that this child is deprived. Temporary custody is with the Department. If the mother applies for an attorney, I’ll consider that. Mr. Smith: Judge, if she applies for an attorney, we’re going to have a problem. Barbara Prindle, RPR, Brunswick, Ga.
Q. How long did you work there? Q. It didn’t work out. Okay. A. I went to California. Q. Much better idea. What did you do in California in 1967? Q. Like most people in California in 1967. Q. You made that check out directly to the insurance company, didn’t you? Q. And, of course, you receive your cancelled checks back from your bank every month? Q. Do you receive a photostatic copy of your cancelled checks back every month? Q. Did you save the check? A. I don’t receive them. So, no, I didn’t save it. Q. Is it a jolting type of bump? A. No, it’s just — it’s not really like a — you hit a pothole or something like that. It’s just — it doesn’t dip you down or anything. It’s just going over it. Just dumt-dumt. Q. That’s all right. I don’t know how she’s going to spell that but —. All right. The reporter: That’s a new one. Mr. Smith: Yeah, and I have no suggestion for you. Diana D. Sabo, Tinley Park, Ill.
Q. By the way, you said you went to Universal Studios — or the Harry Potter World, is that it? Q. Did you buy any souvenirs? Q. What did you get? A. I bought a wand. Ms. Smith: Oh, my god. Mr. Miller: I don’t even know what that is so I can’t judge you. A wand? A. Yeah. You have to. Like, you’re there. Ms. Smith: You don’t know that magicians have wands, Bill? Mr. Moran: I am out of the loop on this. Q. Okay. So you bought a magic wand at the Harry Potter place? Mr. Jones: Objection, I think that mischaracterizes the testimony that the wand was a “magic” wand. Michelle M. Paoletti, RPR, CRR, Tinley Park, Ill.
State’s Attorney: The State has exorcismed — I mean exercised their last strike. The Court: Congratulations to you all, the State has determined you are not possessed. If you’d like to contribute, please send your funny transcript excerpts to Austin Yursik at ayursik@ncra.org. The next RPR and CLVS written knowledge tests will be offered July 8-20. The registration period opens June 4 and will close July 3. For more information, please visit the NCRA Certification Test Center at NCRA.org/testing. Please note that the registration process for the written knowledge test requires registration first with NCRA. Within 72 hours of receipt of your paid registration for the written knowledge test by NCRA, you will receive your email confirmation. Upon receipt of your confirmation from NCRA, you will then need to contact Pearson VUE to schedule the actual date, time, and location to go to a Pearson Vue Professional Test Center to take the written knowledge test. NCRA testing is for stenographic reporters only. The name on your photo ID and the name you register with to sit for an NCRA examination must match to gain entrance to the testing facility. Examination registration cancellations and/or registration requests for test site changes must be submitted in writing by the deadline, using the NCRA cancellation/site change form found online at www.ncra.org/testing. Registration fees will not be refunded for cancellations received after the registration deadline, and site change requests cannot be accommodated after the registration deadline. To ensure that your test materials are available at the test site you register for, please adhere to the examination registration deadlines. The NCRA website (NCRA.org) contains the most comprehensive information on the RPR, RMR, RDR, CRR, CBC, CCP, and CLVS credentials. 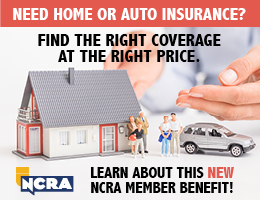 You can also call NCRA’s Member Services and Information Center toll-free at 800-272- 6272. Or feel free to email the NCRA Department of Certification and Testing at testing@ncra.org. Best of luck in your pursuit of professional credentialing and certification! “You all right in there?” hollered the attorney as he knocked on the bathroom door. Hundreds of panicked thoughts raced through my mind. Do I call the court reporting firm that assigned me to this job and let them know what is going on? Will the attorneys automatically send me home for this? Did I mess up the record when, minutes ago, I asked everyone in the room to please excuse me? The uneasiness of my stomach was exacerbated by the fear and uncertainty starting to run through me. After I carefully paced myself back to the conference room and said that we could resume the proceedings, the attorney asked me if the court reporting agency that sent me should dispatch another court reporter. I politely denied the idea and insisted that I was fine to continue. Six hours later, we concluded with the final witness for the day. I packed up and slowly limped to the car carrying my steno machine and laptop. My equipment seemed to weigh a thousand pounds more than usual after a long day of recording testimony for more than eight hours, with no shortage of the attorney and deponent angrily talking over each other at what seemed to be more than 300 words per minute. This was my very first job ever as a licensed court reporter. My mind began to reel at how my very first assignment actually unfolded. I did not have any answers or points of reference for a day like this. My court reporting school or instructors never mentioned days like this. I had no idea if I handled the day’s unusual events correctly or not. I experienced a lot of emotions as I sat quietly in my car that evening, but mostly I felt simply unprepared — unprepared for dealing with belligerent witnesses who refuse to slow down their speaking as they direct livid orations at the questioning attorney; unprepared for the pain and stiffness shooting through my arms after the first three hours of writing to intensely brisk back-and-forth testimony; unprepared for dealing with an unexpected sickness while simultaneously trying to make the best possible impression on my first freelance assignment. Thankfully, there would be more jobs. There would be better depositions. There would be kind attorneys and compliant witnesses who converse with a friendly calm. There would be days where I am complimented for my professionalism and sharp appearance. Thankfully, those days would slowly become average for my life as a court reporter. But I also experienced my fair share of court reporting “horror stories,” as CSRs love to share with each other when they convene. It is interesting to listen to court reporters regale others with their more embarrassing, frustrating, and bizarre jobs. Sometimes these stories are told to entertain; sometimes they are told to educate; other times they are told for what seems like the sake of experiencing a therapeutic catharsis — or even a confession. • What do you do when the attorney who hired you wants to go off the record, but opposing counsel demands that you stay on? • What do you do when an admitted exhibit is a firearm or bag of narcotics? • What do you do when an expert witness’s accent is incredibly heavy, to the point where you only understand every other word they are saying? • What do you do about paying taxes as you begin to make money as a licensed court reporter? Of course, there is a consensus for a “right answer” for all of these example situations. But would a student who is about to take their certification exam know what to do in these instances? Would a court reporter who has been working for only six months in the field know what to do in these scenarios? I have had the pleasure of mentoring new court reporters, most of whom I know through the school I attended and developed friendships with. I cannot count the number of times I have guided new reporters on where to order exhibit stickers, how to keep track of their mileage for each deposition, or how to swear in an interpreter. Each time I give out these useful tidbits of information to burgeoning reporters, it affirms the harsh reality that new court reporters need a lot more attention and help than they are normally getting — whether through their school or not — to ensure that they are doing the best they can for the clients they serve. My older brother became a certified shorthand reporter years after I did, and I remember every day answering a seemingly endless number of questions regarding the tiny, important details of working as a court reporter and how jobs actually happen on a day-to-day basis. There were times when the answers I gave him almost stunned him. Even with his four-plus years of intense training as a stenographer, he was still learning things about the industry that befuddled him. I could almost see the battle taking place in his mind between his expectations of responsibilities as a court reporter and the reality of them. What’s more interesting to learn about many reporters is how long it actually took for them to feel remotely competent at their job — or not. A seasoned Washington, D.C., court reporter candidly told me, “After five years, I was amazed that every day was worse than school, and I was writing like the wind constantly. I was exhausted, discouraged, and ready to quit.” Meanwhile, another reporter said to me, “The real coldwater shock was how long it took me to get comfortable with the job — probably five years.” Just between these two court reporters, after more than 1,800 days on the job, one is barely coping with their assignments while the other is just realizing that they finally feel confident with the day-to-day workload. What is it like, then, for court reporters who have only been doing it for a week? Today’s digital age allows for all sorts of people with commonalities to come together and help each other, especially court reporters and court reporting students or the newly certified. The exchange of information going from wise working reporters to those who just became licensed is encouraging and sometimes moving. You can see the relief when a newbie reporter thanks everyone so much for their feedback and help after posting their current questions and frustrations. I gladly participate in the daily encouragement and guidance of students and new reporters. Telling a new reporter where to place a comma in a witness’s answer can be more than a brief lesson in grammar; it can be a reassurance that they are not alone. In my mind’s eye, I sometimes look back on the young man who unintentionally threw up in the attorney’s guest restroom on his very first job. I would have gotten on the phone with him that night and asked him how his first day went. I would have encouraged him to laugh about it, convince him that it will make a great story for other new reporters in the future. Then I would have shown him how to handle things like that in the future if the occasion should arise. Someone trying to pass their court reporting certification exam once wrote me after I offered them advice and said, “You are a blessing to the court reporting community.” While that is a very kind thing to say, it made me realize that is actually exactly what we are: a community. Communities thrive by being self-sustaining and self-healing, by letting the stronger portions support weaker portions, by having its inhabitants serve one other whenever they can. Everyone can contribute something in their own unique way, even if it is just a little. There is no doubt: Offering your unique help to those who need it in our precious community goes a long, long way. Looking for a job in today’s competitive market can be difficult. So how do you make yourself stand out among the competition? How do you get a potential employer to take interest in you and want to interview you? According to the pros, the best way is to differentiate ourself. Focus your résumé around your strengths and goals. Let your unique skills and abilities shine, every step of the way — from your résumé to the follow-up after an interview. Positive first impressions can help you stand out among the competition. Your first opportunity to make a good impression is with your résumé. The person reviewing your résumé is generally the one who will decide whether you will get an interview or not. So consider your résumé your first interview, as well as the first opportunity to promote yourself. Pay attention to detail. A résumé should be easy to read, concise, neat, and well organized. Undoubtedly, a future court reporter should use proper grammar and correct spelling. When a résumé is free of errors, it allows the reader to focus on the content. In addition, résumés should be tailored to each specific job or position you are applying for — they are not one size fits all. Read the job description carefully and figure out what qualifications the employer is looking for and what you can offer them. Then tailor your résumé around the skills and experience you have specific to that position. Be sure to showcase your skills and abilities. List any credentials you have, as well as membership in any court reporting or other professional associations and any relevant experience. It is also important to include the court reporting program you graduated from and your academic achievements. In addition, make note of any efforts you are taking to further your skills, and include activities that reflect good social skills such as groups for which you volunteer or social groups with which you are involved. Along with listing your skills and experience, consider including how those skills can benefit your potential employer. If you are a young professional just getting started in your career, outside activities can provide you with the experience to show skills you may not have had the opportunity to use in your professional life, such as leadership, organization, and time management. Finally, always volunteer a difficult transcript for your potential employers to review. “When a reporter volunteers a transcript, I am always impressed, provided it turns out to be excellent, of course,” said Tiffany Alley, RPR, founder of Tiffany Alley Global Reporting & Video in Atlanta, Ga. It is better to be 10 minutes early than 10 minutes late. 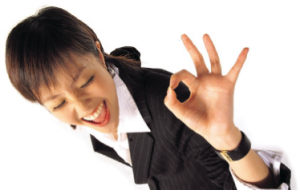 Being prompt for your interview shows you want to be there and you respect the interviewer’s time. When introductions are made at an interview, be sure to make eye contact, give a firm handshake, and address the interviewer by name. 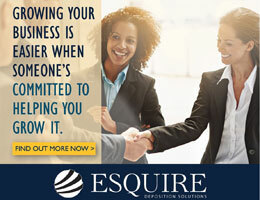 “It goes without saying that there’s never a second chance at first impressions, so appearance and friendliness must always be tops,” said Robert Gramann, RPR, President of Gramann Reporting & Videoconferencing, in Milwaukee, Minn.
During the interview, convey that you are willing to go the extra mile to keep attorneys loyal to the company you represent. Demonstrate flexibility and a cooperative attitude. Be yourself. Try to relax and enjoy learning about the job opportunity, expectations, and the people employed there. Focus on what the interviewer asks and then be concise but thorough when answering. If it helps to illustrate your skills, provide an example of the work you have done. Be honest. If you don’t have a particular skill, just state that and follow up with your intentions of future plans to gain the necessary skill set. Research the firm before your interview. During the interview, ask great questions to show that you are familiar with the company and the specific position for which you are applying. Bring a copy of your résumé to an interview along with two or three business references and their contact information, and be prepared to leave this information with the interviewer. Also, be sure to make contact with your references in advance to tell them you are interviewing and with which firms so they are prepared and not caught off guard. Finally, ask the interviewer for their business card. Their business card will help you remember their name, provide the correct spelling of their name, and list their street and email addresses. This is all crucial information you will need when you send a thank-you note. Follow up any interview with an email or hand-written thank-you note to each person with whom you interviewed. Since many people don’t follow an interview with a thank-you note, doing so makes you stand out from the crowd and can help reinforce that you’re a strong candidate. A thank-you note shows good business etiquette and reinforces your interest in the position. A thank-you note can also be used to address any issues or concerns that came up during the interview. Briefly thank the interviewer for their time, restate why you want the job, and write something about how you intend to make a contribution to the firm. If you interviewed with several people, add something specific about that interviewer, making each note unique. Keep it short and simple — a couple of paragraphs is adequate — and make sure to proofread the note before sending it out. Try to send your thank-you note that evening so the interviewer will receive it the next day. If that is not possible, make sure to send it within 24 hours of the interview. Even if you feel a particular job is not for you, follow up with a thank-you note. Potential employers will remember you and may call you back for another position or recommend you to another firm. Personal contacts are invaluable when it comes to getting noticed. It is often said it is not what you know, but who you know. It is never too early to begin networking. Networking is all about building relationships. It goes without saying the more time you have to network, the larger your network is going to be and the greater the potential for launching your career. Networking is an investment in your career and your future. Start networking while you are still in school. One of the best places to network is at your state association events and NCRA conventions. What better place to meet prospective employers? “I’ve found lots of work because of contacts I have made there,” said Joshua Foley, a recent graduate of College of Court Reporting, in Hobart, Ind. Social media sites such as LinkedIn are also a great place to network. Join and actively participate in court reporting forums and other career-related sites. Social media can be used as a tool to promote yourself by connecting to sites like a company’s LinkedIn page. “Social media is like many other forms of advertising. If your name keeps popping up in different but related reporting venues, your chances of obtaining a reporting position increase,” said Gramann. Make sure to recognize, however, that social media has the potential to make or break your career. Social media should focus on activities and endeavors that show good judgment. Many employers check social media sites such as Facebook, Twitter, and LinkedIn to learn more about potential candidates, so consider social media sites as part of your résumé. Use your spare time to increase your writing speed. “Extra speed is like money in the bank. Become an expert at using your CAT software by signing up for training, attending webinars, viewing tutorials, and reading the manual,” said Gramann. In addition, be willing to contact all the major firms in your area and ask to be put on their overflow list. “Take whatever job is offered to you and exceed production expectations,” advises Valerie Seaton, RPR, CCR, president of Moburg, Seaton & Watkins, in Seattle, Wash. Looking back 32 years ago when I started, the answer to what basic equipment was necessary for a new reporter was easy: Machine, paper, ink, dictaphone, an IBM electric typewriter equipped with what we called the court reporter ball, more paper, and carbon paper. We have come a long way in that time period. Now the premise is all CAT, all realtime — or should be with brand-new reporters — and wireless technology. My list is going to be twofold: first the bare necessities, and second, what you need if you want to excel. The court reporter model writer. A student writer just isn’t going to be able to do the job. The court reporter version of your CAT software. Again, the student version won’t cut the mustard, and most CAT companies won’t let you stay on it the first time you renew after school. A good notebook computer. Notice I didn’t say expensive. You can buy a fullsized, no frills, yet completely acceptable notebook for under $400. A good wheelie carrying case. Save your back from the start. The above, except for the computer, can be purchased through your CAT vendor for a realistic monthly payment. More dictation material! You need to pass the RPR, so get the dictation material you need, and get the prep pamphlets for the Written Knowledge Test. Because you can earn the RPR in legs, there is no excuse for not taking and passing it as you are ready. Get Wi-Fi for yourself on your jobs. You can tether your smartphone to your computer using tether.com, or you can often share your Wi-Fi connection with your phone if you have a data plan. I use a Mifi. It’s $50 a month, and I can share 10 connections if I wish. But you need Wi-Fi to quickly look up terms you’re not sure of on your breaks. Searchmaster. You can look up tons and tons of information with cool word searches and also search your past transcripts for names or terms. You can get it from Eclipse, Pengad, or gosearchmaster. com. A scopist. The number one problem most court reporters face when they get out of school is knowing how to put the page together. Unfortunately, the formatting can change from state to state, from jurisdiction to jurisdiction, and even from court to court. The better you understand how it’s supposed to look on the page, the easier it will be to write what you need to on the machine to make it look that way. Scopists are an invaluable tool in helping you see the page like it should be, and they can help you build your dictionary. Find a good one and you can develop a partnership that will last for years. Oh, yeah. Pay them right away. Even if it means tightening up on your grocery money. You can find scopists at Scopists.com, in your CAT specific forums, or through NCRA’s Online Sourcebook. Cabling for realtime. You need to learn how to hook up someone else to your computer, whether you’re ready for it or not. You want to know a secret? Nobody feels ready for it the first time. It’s like writing naked in a sandstorm. Raw, gritty, and very exposed. But we all had to do it, we all did it, and we all got past it. As with learning to write, practicing is important. By practicing, you keep getting better. No one wants to pay you for something that they could have understood better and made better notes in longhand. Copies of the notices for the job you’re taking. You can glean items for your job dictionary from there. For example, look for the city, state, and jurisdiction of the case. Get the case name in full, including first and last names of the parties, the attorneys, their law firms, and addresses. Look up the name of the deponent online; e.g., looking up physicians can get you a pretty good idea what kind of medicine they’ll be talking about. Preload your job file with briefs or names. Your depos will be half done before you start. Guys, wear a suit. The most casual you should let yourself be is a sport coat, tie, and khakis. I know the attorneys are showing up sans tie. You aren’t an attorney. This is your workplace, and you need to dress appropriately. Don’t overdo it, though. What your wife or girlfriend might love to see on a formal date shouldn’t be worn in a deposition suite. You might get a reputation as a dandy. Yes, I know that’s a dated word. It still applies. Look it up. Ladies, the courtroom is not a place for cleavage. Wear nice suits or pantsuits. The skirts need to be at the knee, not above the rear. You need to have a professional look. I’ve seen what some think passes for a professional look. It does — just not our profession. After you get your RPR, don’t stop. Test-taking is habit-forming. Not taking tests is an evil addiction. It means you’re stalled and stagnant. So keep up the practice. You never stop learning. You need to be well-rounded. Read the news daily on an Internet site of your choosing. Television is all well and good, but you’re not going to get the spellings out of the air. I guarantee they will talk about what’s currently in the news in your depositions, even in discussions that are not on the record. If you want to be seen as competent, don’t give the glassy-eyed answer to a question on current events. To be confident, you have to give the appearance of being competent. Despite all the technology we use, this profession of ours is people-driven. If your clients don’t see you, if they don’t get to know you, if they don’t trust you, your tenure will be short-lived. Remember, practice, practice, take tests, and become one of the members of the top echelon of court reporters so that you can compete with the big dogs and win. It’s like an ad on a matchmaker’s website: “Student seeks steno happiness with a partner who is reliable, understanding, and a good communicator.” Steno students are dedicated to the pursuit of steno happiness and finding the pleasure that comes from writing quickly, accurately, and easily all the words that someone says. Steno students enter their new relationship with their steno machine with as much preparation as they can muster. If you are a student, undoubtedly since you first explored the idea of becoming a member of the court reporting profession, you have been told that learning steno can be tough. You realize that practice is mandatory for speed development, that you will need to learn how to navigate and use a court reporting software program, and that you will need to understand court procedures. You have imagined yourself succeeding. You have changed your lifestyle to accommodate school and practice. You don’t watch (too much) television (anymore). The kids and your spouse are helping out with family chores. You feel like you practice all the time, but it still sometimes feels like you are not moving forward as well or as fast as you hoped you would. You’re not feeling all that happy! Do not despair and give up and let steno happiness elude you. It can be yours, but it takes effort, and there are things that you can do to attain success. Let’s face it: Learning something new can be hard. Steno is usually very foreign to new court reporting students. Learning the theory concepts is sometimes complicated, and the rules tend to feel overwhelming. Executing keystrokes reliably is awkward and physically challenging. Remembering the rules and the outlines takes a lot of effort. And that does not take into account the work that goes into learning how to create a title page, fill out a worksheet, swear in a witness, and learn about how freelance jobs are assigned or how to prepare to caption the evening news — not to mention how your best laid plans to juggle work, family, and any semblance of a personal life have gone way off track. So, what’s a student to do? There are a number of things that can be done to enhance the learning process, motivate one to practice, and build court reporting skills. In this article, we examine some tried-and-true activities that will support your overall educational efforts and help you reach your court reporting goals. Get organized. At the start of the semester, find out what dates homework is due and when tests are offered. Put these dates in your calendar right away, and then modify the calendar as dates may be changed. Keep the calendar where you will see it every single day. If you are using a calendar app on your phone, you have access to that tool probably every waking minute. As soon as you know the dates, enter them! Check the calendar every day so that you know what is due and when. If you are using a paper calendar, put that calendar where you will see it. Keep it near your desk or hang it on a door that you use each day. Make it a point to be reminded at least daily of the requirements and the deadlines, and don’t ever ask to turn in anything late. It’s your job as a student to find out when things are due and what is expected of an assignment or test and to prepare for it. Organize your personal life as well as your school life. Don’t make dates to go out the night before a speed test. Plan to get up early and practice if you have an obligation that must be met that evening. Look around the house and find out what really needs to be done by you and what can — and should — be done by someone else. Schedule errands ahead of time and then take care of those things in an efficient manner. Create a checklist of places you must go, such as the bank, post office, and grocery store, and then map out the most efficient way to reach each destination. Share your steno happiness. Set aside personal time for your loved ones and take care of those relationships. Thank everyone who is helping you and thank them frequently. Share your goals, and let your loved ones know what’s on your calendar and how much you appreciate their support. You may be writing on the machine and studying the legal vocabulary, but your support team is helping you have that time to yourself. Share your success and steno happiness with others, and you will have more help, more success, and more steno happiness. Be rested before tests. Get a good night’s sleep before every speed test. It is essential that you take a speed test when you are physically in the best shape you can be. Along with a good night’s rest, eat a healthy breakfast and/or lunch, depending on when you’re taking that test. Writing on too little sleep with a cookie for energy does not bode well for a successful test attempt. Like a race car driver, you need to put the best fuel into the tank to win the race. Be a winner by preparing like a winner, and remember that winning makes you feel happy. Commit to practice every day. No matter what else is going on, practice. Even five minutes of practice or review will have a positive impact. Skipping a day of practice will never have a positive impact. Contrary to what anyone may say about taking a break, ignoring steno will not make it easier to write. If you can’t physically sit at the machine and write, you can read over some rules, look at any text, and think about how you’d write those words in steno. Keep a list of brief forms and phrases in your car or purse so that if you have a few minutes, you can just quiz yourself on those words and outlines. Talk yourself through a few theory concepts. When a moment presents itself that you can use for the pursuit of steno happiness, take it! Practice and study with friends. Having a steno buddy who really understands not just what you are going through emotionally as you work toward your court reporting education, but who shares your educational goals is a sure way to build skills in a happy and friendly atmosphere. Learning in a social environment can boost your understanding and motivation. If you are a distance-learning student, no worries; with Skype or Facetime, you can talk face-toface, get questions answered, and explore ways to write. Log on to the Internet, make a plan to practice a while, and then reconnect to discuss how it went, which words were tough, which were easy, and which practice techniques helped the most. We often learn best when we are the teacher, so assisting a friend to decipher an untranslated outline will help you to recognize the same or similar mistroke in the future. Knowing someone else is practicing at the same time will lessen the isolation you feel when you are listening and writing in a world no one around you really understands. Some say misery loves company, and so maybe sharing the challenge of practice and study places students in good company. But perhaps Henry Ford said it better: “Coming together is a beginning; keeping together is progress; working together is success.” Practicing and studying together can lead to great success and the acquisition of skills, along with a sense of accomplishment and happiness. Have a happy attitude. Why not? Complaining won’t make anything better. Take each moment of practice and study, and consider it a valuable step toward your future. When you hesitate to stroke a word, be glad that happened when practicing and not in a test. Work out the outline and reinforce its correct construction and keystroke. Recognize your accomplishments, and push yourself to do more and get more out of each practice or study session. If you’re not positive you can meet your goals, then who else will be? Be happy with what you are doing to promote your learning goals. Ask for help! Talk to your instructors when you are having trouble understanding theory or a procedure or a software process. Your instructors want to help you. Nothing makes an instructor happier than a successful student — except being the instructor whose advice is being used by the student. Take advantage of the knowledge and skill of your instructors. Let them help you. You’ll make them happy, and you will be happier in return. Read, read, and read some more. When you are not particularly working on steno or school work, read the paper, magazines, articles, and books. Fill your mind with information, knowledge, and understanding. If you come across a word and you don’t know its meaning, look it up. Somewhere, someplace, someone else is going to use that term, and won’t you be happy that you know not just what it means, but how to write it in steno with perfect translation? Write purposefully. Too many students spend too much time writing mindlessly. Select dictation for practice that is just a bit challenging. Write the whole take and check it against the dictation. Rewrite any mistroked words. Rewrite them many times correctly. Rewrite the dictation exercise and stop when you hesitate. Rewrite that section until you can do so without hesitation or error. Keep track of your mistakes as well as your successes. Really know by reviewing if you “got” the whole thing or not. Take responsibility for your writing. Don’t fool yourself into thinking you are a better, faster, and more accurate writer than you are by only looking at the untranslated outlines on the screen or by glancing at the accuracy report presented by your electronic performance support system. All mistrokes can and should be fixed purposefully so that they won’t happen again. By taking responsibility, you will be happy with your writing and not frustrated or disappointed. Reinforce correct writing. Continually write something that you are writing well. That’s right. Build up your muscle memory by repeating exercises for accuracy and precision. Increase speed slowly, checking for accuracy and no dropped words, and then inch up the speed again. As a student building skills, you must be aware of what you are writing and that you are getting all the words with accuracy before going up in speed. Think of all the athletes and musicians in the world. They don’t throw the football the wrong way over and over again; they throw it the right way. The base ball player doesn’t swing the bat too low over and over again; he swings it at the correct height. The piano player doesn’t play the chord wrong every time she sees it in the music; she plays it correctly. Apply that method of reinforcement to your practice, and you will be successful and steno happiness will prevail. Just keep going. When you think you cannot write another word, do it anyway. When you are too tired to practice another five minutes, practice five more minutes anyway. When you don’t want to review brief forms in the line at the store, choose the longest line and do it any way. It’s only too late to achieve success when you stop working. Just keep writing, practicing, and studying, and you will find yourself in the middle of steno happiness.